Edible Skinny was lucky enough to be Seattle a few months ago while performing with the amazing Pin-Ups on Tour and while there we were able to experience local coffee roaster the Freemont Coffee Company. Freemont is Seattle’s funky, creative district where your inner child, communist or troll (living under the Aurora Bridge in this neighborhood) comes out to play. So it’s only fitting the Freemont Coffee Company would embody the rouge unconventionality that this city embraces in totality. In case you weren’t aware, Freemont is known to be a special geophysical local. The locals will tell you, “Stay long enough and you’ll notice an odd gravitational pull. It’s an inability to stay away, the overwhelming urge to return again and again.” So in 1991 at a local bar, some Fremont Scientists determined the Center of the Universe to be at the intersection of N Fremont Ave and 35th St N, with the reasoning that this local can neither be proven, nor disproven. After much politicking, cajoling the group was able to convince the Metropolitan King County Council of this truth and the group were able to officially name the Center of the Known Universe Fremont. The official proclamation noted: Freemont is a State of Mind, no a foreign nation but an ImagiNation based on the freedom to dream. So it’s totally fitting that the Freemont Coffee Company is everything but a corporate Starbucks. Since opening in 2003, Freemont Coffee Company artisan-roasted, Fair Trade and organic coffees have become a local staple for those sipping-in or to-going out. Housed in a historical home and decorated with macabre knickknacks such as bronze skulls and Bastets (the Egyptian Cat God statues) it’s just the right amount of funky. This shop is the one of a kind coffee joint where you can spend (or waste) an entire day. Dogs abound, comfy chairs, and a wraparound porch that is perfect for counting raindrops, snowflakes, or those precious 58 days of sun that Seattle gets per year. Freemont’s coffee mantra: Complex passion. Simple approach. The company meticulously curates each bean individually, roasts them attentively, and blends intelligently. The results are coffees with distinct flavors reflecting their origin along with the company’s distinctive personality. Their skeleton inspired Boneshaker House Blend will perk you up to the point where you’ll want to shake, rattle, and roll the night away. As an added bonus your guilt free conscious Joe is always served with a side of clever (one of my favorites was a sign declaring “Keep Calm and Pumpkin Spice Everything.”). So for the perfect bone shaking cup of coffee at the Center of the Universe, check out Freemont Coffee Company. Here’s to life being delicious and to today being one of those 58 Seattle days of sun! Pho-nomenal! The World of Seattle’s Favorite Vietnamese Soup: Pho! A few months ago I was lucky enough to experience on the classic dishes of Seattle while performing with the Santa Monica based Pin-Ups On Tour: Pho! Seattle has a large Vietnamese population (large enough that there’s a section of the city called Little Saigon) and pho is known as the National Dish of Vietnam. It’s absolutely un-pho-gettable! For those not familiar, pho is a noodle soup consisting of beef broth, rice noodles, herbs, and vegetables. It originated in the early 20th century in northern Vietnam, and was popularized throughout the rest of the world by refugees after the Vietnam War. It’s eaten for breakfast in Southern Vietnam, while northern Vietnamese consume it any time of day. Regional variants of pho are segmented into “northern pho” which normally tends to use wider noodles and large quantities of green onion in its dish. “Southern pho” aka “Saigon pho” has a broth that is slightly sweeter and has bean sprouts and a greater variety of fresh herbs. While in Bellevue, a posh section of Seattle, we were able to squeeze it a dinner at the classic What the Pho! It’s almost a requirement that pho restaurants have pun-y names, some of my absolute favorites include 9021Pho and Absolutely Phobulous in LA. What the Pho!’s broth is crafted through their meticulous twelve-hour process of careful summering and a specialty blend of herbs. This fragrant broth is then combined with fresh rice noodles, thinly sliced cuts of eye round steak, brisket and flank, book tripe, tendon squeezed lime, bean sprouts, sliced jalapenos, and fresh Thai basil leaves. Since I’m a Veg I indulged in phở chay a vegetable broth version substituting anything from a cow for deep fried tofu and vegetables. The result was a large steaming bowl is hard to resist!!! To compliment my pho I (naturally) had to get a Vietnamese coffee. The drink, served Iced or Hot, is espresso style coffee crafted with sugary sweet condensed milk. With its strong bold flavor (this was Seattle...) balanced with a Nutcracker like sweetness, it was the perfect after meal demitasse. So if you’re looking for a dish that’s Pho-ever Yum in the Seattle area, What The Pho should be on your list!!! Here’s to life being delicious and absolutely pho-bulous!!! Although Edible Skinny wasn’t able to make it to the Natural Products Expo this year in Anaheim, we were still able to experience some of the products offered there via the good old fashioned postal service! Hooray!!! One such product was Van’s, based in Southern California, which offers delicious nutrient-dense foods that focus on the growing need for expanding dietary options, including gluten-free allergy-friendly, non-GMO kosher whole grain and more. 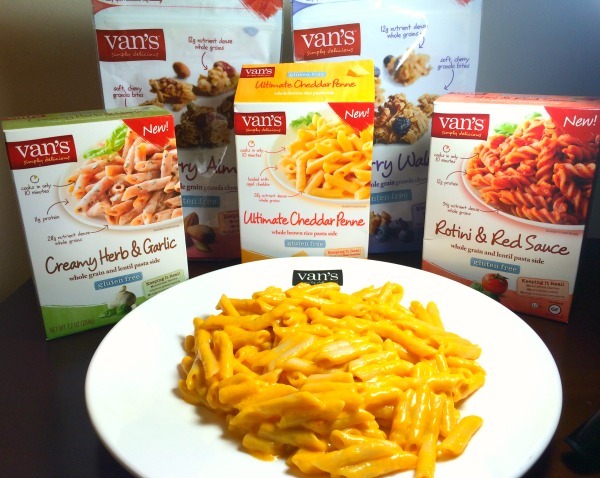 With the tagline “Gluten Free Goodness,” Van’s products are certified gluten free by the Gluten-Free Certification Organization (with their seal of approval stamped on every box). Their synthetic and artificial flavor free products include frozen breakfasts, snack food and pastas available at grocery stores, mass merchandise stores, and natural food retailers nationwide. Now I’m not one for carbohydrates (don’t get me wrong, I absolutely LOVE to eat them, it’s the result I don’t adore…) but when I do turn to the dark side of carbs I usually try to make it gluten free. That’s why I LOVEd experiencing Van’s gluten free boxed pasta meals: simple, gluten free, and yummy. These prepackaged pastas are craveable gluten free varieties that can be prepared on the stovetop in just 10 minutes. Easy peasy nice and breezy!!! 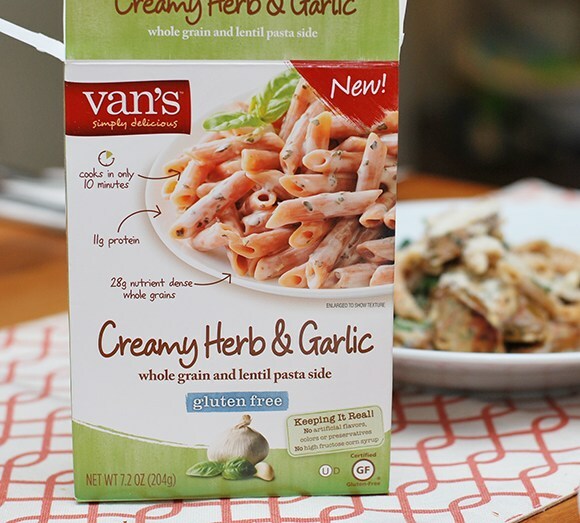 Van’s Creamy Herb & Garlic is the fancy pants version of Kraft Mac & Cheese (and healthier!). Boil the pasta, drain, create the sauce with butter, milk, and their cheese packet, combine, and enjoy. The result is a deliciously sophisticated savory taste with 11 grams of protein and 28 grams of whole grains per serving. But if the classic Kraft Mac & Cheese is what you crave, Van’s also offers The Ultimate Cheddar Penne, a bright orange pasta meal that will totally bring you back to late night cram sessions for Biology 101. Or if you’re looking for something on the tomato end of the pasta spectrum then the Rotini & Red Sauce is a simple fun gluten free option. So if you’re avoiding the dark side known as wheat and gluten and you’re looking for the perfect boxed pasta for that quick meal or late night trip down college memory lane than Van’s might just be the way to go. Here’s to life being delicious and having the force be strong with you (even if you indulge in gluten free carbs from time to time..)!